NEW YORK (AP) — J’Nai Bridges was just 24 and still in school when she sang her first “Carmen” as a young artist at the Glimmerglass Festival in 2011. Young as she was in that Glimmerglass performance, she impressed Francesca Zambello, who had just become director of the summer festival in Cooperstown, New York. Zambello will be directing her in San Francisco, and Bridges, just turning 32, thinks she now has the “life experience and vocal maturity” to do justice to the role of the free-spirited gypsy who refuses to flinch even at the prospect of death. Bridges had been studying voice while growing up in Washington state but also was a star shooting guard on her high school basketball team. Had it not been for a falling out with her coach, she might well have pursued sports rather than singing. Instead, she left home to attend the Manhattan School of Music in New York, continued her studies at the Curtis Institute of Music in Philadelphia and then did a three-year residency at the Ryan Opera Center, the Lyric Opera of Chicago’s artist development program, finishing in 2015. Up to now, many of Bridges’ roles have been in contemporary opera, starting with her professional debut in 2015 in the Lyric Opera’s “Bel Canto,” an adaptation of the Ann Patchett novel with music by Jimmy Lopez. She’s also been featured in two Philip Glass operas and sang in the San Francisco Opera’s world premiere of John Adams’ “Girls of the Golden West,” a role she’s repeating in Amsterdam this season. 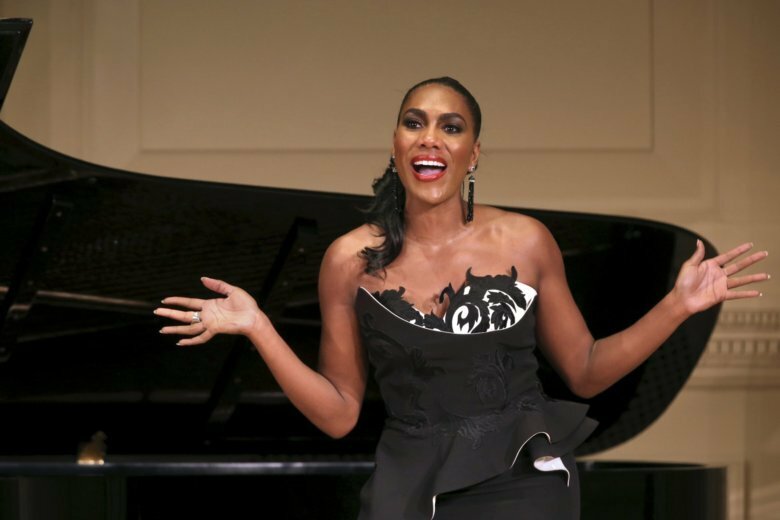 In December, Bridges gave a recital at Carnegie Hall’s Weill Recital Hall, and after ending her program with a group of spirituals and an encore of the Habanera from “Carmen,” she did something unusual: Addressing her audience directly, she linked the message of spirituals to the need for social change. “I debated saying anything,” she recalled. “But as Americans, we’ve gone through a lot. … I feel we’re in a really trying time. As an artist, as a singer, not only do I have this gift and calling, but I feel like an ambassador for change through my gift. “And I feel that way because being an African-American opera singer, it’s not something you see every day,” she added, “… and so I know a lot about our history, that it’s taken a lot of trials and tribulations for me even to be able to sing at Carnegie Hall.